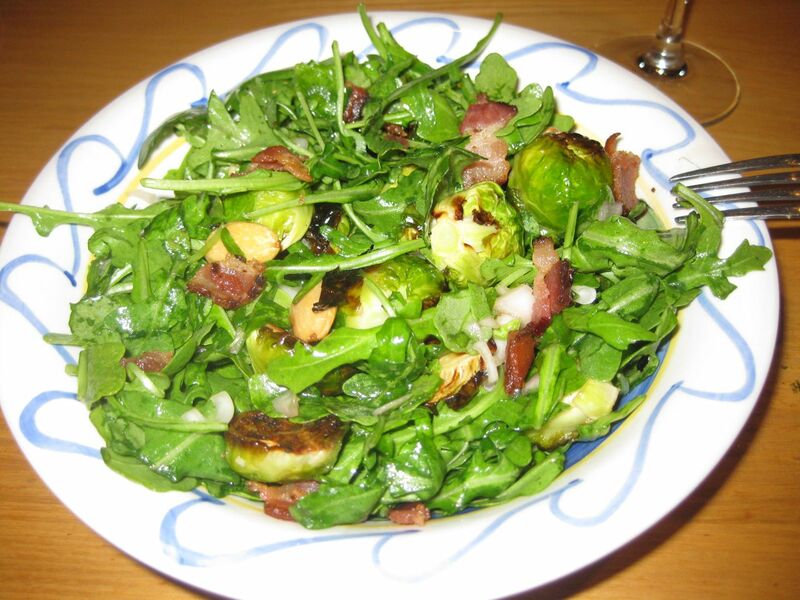 I give you: Arugula, roasted brussels sprouts, bacon, and rosemary marcona almonds in a red wine vinaigrette with shallots and cracked pepper. Enjoy. I love roasted vegetables. I love the caramel color. I love the mild sweetness and the salty crunch. I love the warmth. 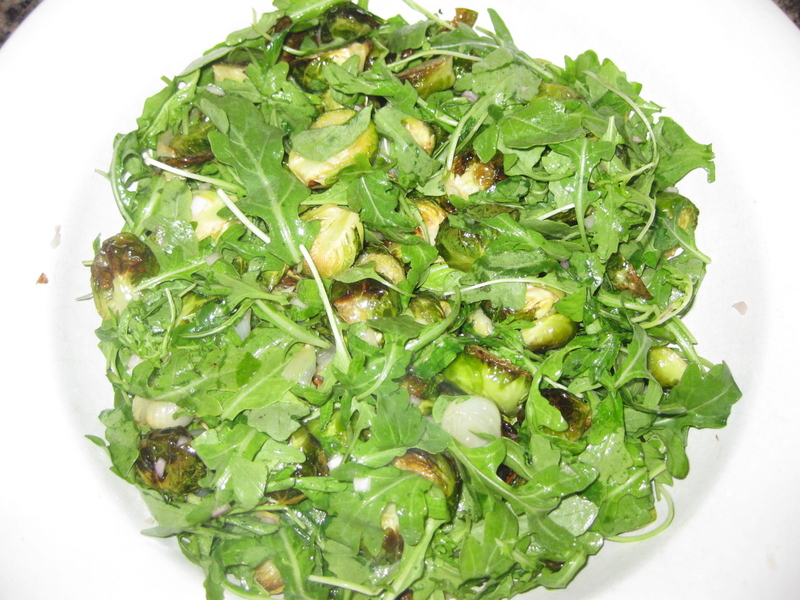 Not long ago, I made a roasted brussels sprout and roasted artichoke heart arugula salad, and it turned out so incredibly well that I’ve been dreaming about making another. While picking over the pathetic produce selection at Trader Joe’s, I noticed bags of brussels sprouts that looked decent, so I snatched them up. 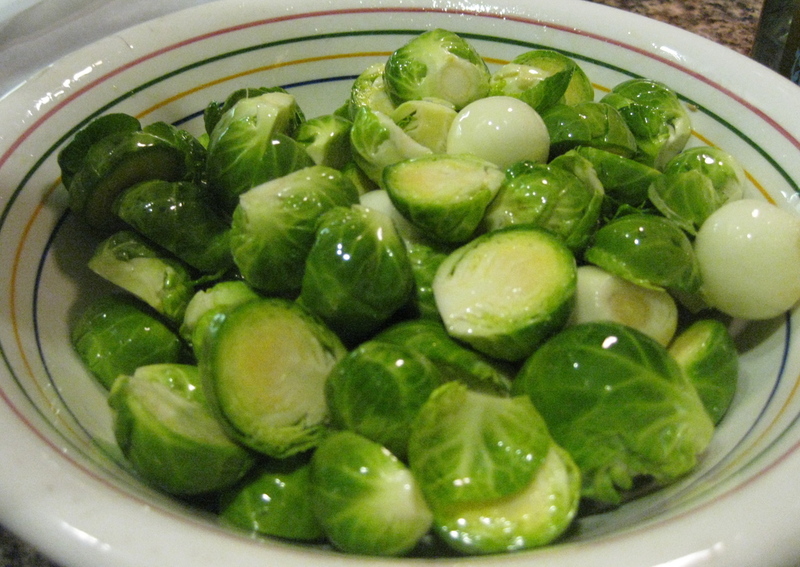 We also had a handful of pearl onions, so I tossed those in to roast with the brussels sprouts. I served this with roasted marble potatoes (no, not from Trader Joe’s — still on hand from my last trip to the Berkeley Bowl), and braised chicken tenderloins. Brussels sprouts and pearl onions, coated in extra virgin olive oil and ready to roast. 2 pounds of brussels sprouts, trimmed and halved. 10 pearl onions, peeled and halved. Extra virgin olive oil, as needed for roasting. Salt, as needed for roasting. I prepped the brussels sprouts and the onions and coated them with extra virgin olive oil before spreading them out in a baking pan lined with parchment paper. I like parchment paper. I get all the yummy browning without having to scrape the vegetables out of the pan. I sprinkled salt over the brussels sprouts and pearl onions, and popped them in the oven underneath a similar pan full of potatoes. Convection roast, 400 degrees, until they were brown and delicious. I stirred them once or twice. I don’t think it took more than about twenty minutes total, though I might be underestimating. We had a lot going on that night — battles to break up, and friendships to restore. While the veggies and potatoes were roasting, I dealt with the chicken and prepared the vinaigrette. I also piled a whole lovely bunch of arugula into a bowl. 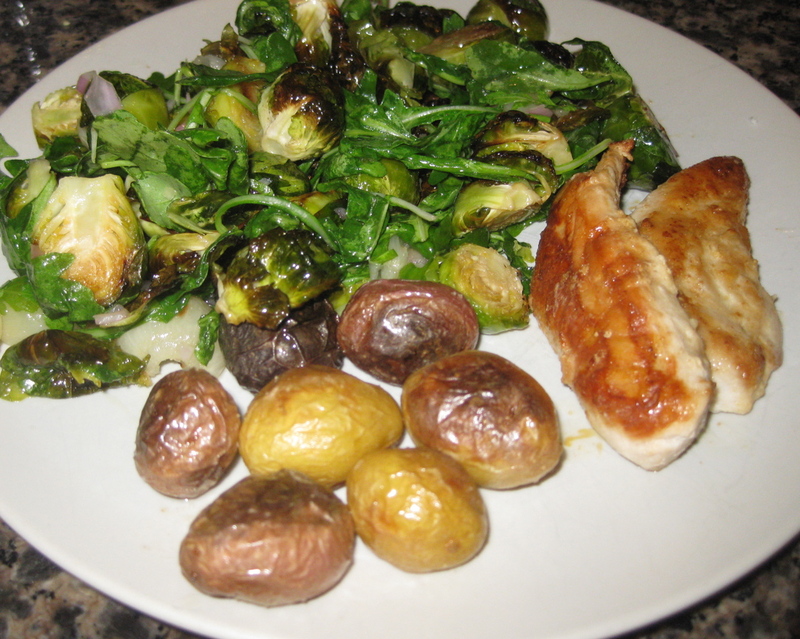 Once everything had finished cooking, I let the brussels sprouts cool for a few minutes (not long at all — I like this salad with the arugula a little wilted) and then I added them to the salad bowl and drizzled the dressing over the top. Still delicious. Perfect rainy weather salad. I love the way that the shallots soften just a little when you toss the vinaigrette with the hot brussels sprouts. While the artichoke hearts from a previous salad were fancier, the onions were equally good. Either will add a little extra sweetness, and help diversify the salad. I recommend choosing one when you play, as I think both at once would take away from the elegant simplicity of this salad. Dished up and ready to eat! I could’ve chopped the chicken into the salad, but I like it better on the side. I’m not sure I’d want to make this one a meal. I really love its simplicity. If you pack it, you’re eating it cold. It’s best warm, but it actually makes great leftovers. I had it cold the day after I made it, with a piece of the same chicken, and it was very tasty. Not the same experience, and the arugula was truly, completely, irrevocably wilted, but I liked it. I think it’s important to have more roasted vegetables than arugula if you eat it leftover. I don’t save salad. I never eat leftover salad. But somehow, this one works — my exception that proves the rule.